This past weekend was super busy, so I didn't have time to post my runday favorites. I decided to do my long run on Saturday because I had plans for Saturday night that included staying up late and having multiple drinks. Friday nights I am usually wiped from working a 12 hr day, so I thought it'd be best to stay home Friday night and get up early Saturday to run and then be able to enjoy myself Saturday night. So that's what I did. For the first time since I ran my first marathon in 2007, I brought Gu with me on my run. I want to start experimenting now so when marathon number two comes around in October I'll be a pro at what my body can and can't handle. It's been so long since I've used Gu that I had forgotten what it tasted like and was slightly nervous about trying it again. I bought a few different flavors and brought vanilla with me on Saturday. Surprisingly, it turned out to be a runday favorite. The texture was a little strange, and it was thicker than I remembered, thankfully I had water with me to wash it down. But I thought the flavor tasted like vanilla cake batter...yum! I took it around mile 8 and it gave me a nice pick me up for the remaining 5 miles. I was dreading trying these again, but now I'm kind of excited to try the others I bought. Another runday favorite was the new sneakers I ordered on Thursday that showed up on my doorstep on Friday! Free overnight shipping?! Thank you, Zappos! 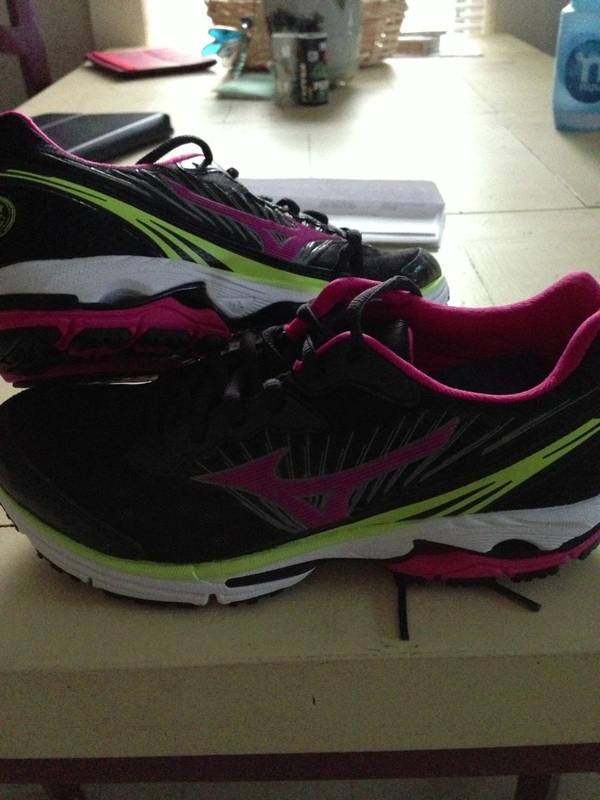 I am hooked on Mizuno Wave Rider 16. I've always been a loyal Mizuno runner and have tried a few different models, but recently I've returned to the Wave Riders and absolutely love them! In race news, I am running my very first 5k on Thursday, July 4th. I'm scared. I think it will be fun, but I'm nervous to pop my 5k cherry. I've also heard/read more than once that 5k's are brutal and not well liked. BUT I guess I should decide that for myself. I'm really curious and figured I had to try one eventually. Who knows, maybe I'll love it! Or maybe I won't live through it. go easy on me, please.